July 29th, 2018 – Ms. B, Gillette Black, and Angel Elektra aren’t the typical volunteers you might see reading to children at public libraries, but that’s exactly why they’ve stepped into the role. 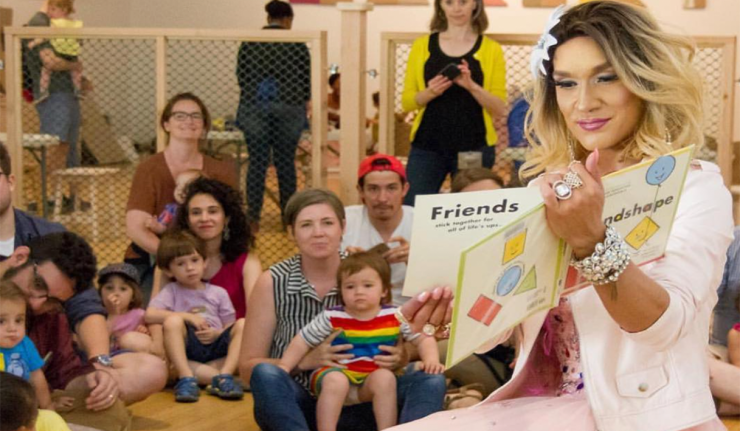 These three drag queens, alongside many others, are part of the newly formed Drag Queen Story Hour and hope their presence will help kids understand the importance of acceptance, diversity, and individuality. The program was started in San Francisco three years ago but has now expanded with chapters in over 20 states. Ms. B shared what a typical session of DQSH is all about for a special with In The Know. She explains to the group of children what a drag queen is by saying that it’s “a character you create to express your feminine side or any other side of yourself that you’d like to explore.” After one girl says she could be a superhero drag queen, Ms. Bee leads the group in songs and dance, as well as more story time. “DQSH helps teach kids to accept themselves, and let them know it’s okay to be themselves and to accept others,” she said. Virginia Beach became the latest city to book a DQSH session. Katie Cerqua, the local library systems youth and family services manager, told WAVY.com that she feels great about bringing the program to her town. As word spread about the new program, media outlets jumped on the story to get reactions from parents. While there was the expected pushback, many parents were excited to bring their kids and allow them to get to know different types of people. The Christian Broadcasting Network, unsurprisingly, found many people who were vehemently opposed to the idea. “No!!! Just because other people want to live their lives this way should not mean they get to force it on others, especially children” they quoted one Facebook user as saying. No DQSH sessions have been reported as being forced upon any library-goers. As with any other event, reservations must be made in advance online. The Virginia Beach Public Library’s July 28th event is already sold out, but parents can put their names on a waiting list if they want to see what it’s all about.